Turn on the radar for your retail storefront! Analytics provides an important way to measure how well your products are doing in a digital retail business. They act as a report card of the effectiveness of your merchandising and marketing efforts. Without analytics, you are flying blind and making wild guesses into where to invest your efforts. But actionable analytics are even more critical for your business as they transform boring analytics reports into real time data that trigger your fingers to leap into action to affect the livelihood of your digital storefront. Take action based on what you see! In Smart Merchandiser, you can turn on the Analytics for each product and immediately take action. You can drag and drop the products that have the most Views and Sales to the top of the page while demoting products that have a low conversion rate to the bottom of the page. This is just an example of how easy it is for merchandisers to affect the display of products on the page. Smart Merchandiser pulls real-time data from the top three analytics engines: Google Analytics, Adobe Analytics (known as Omniture) and IBM Digital Analytics (known as Coremetrics) and displays it on each product image. Quickly Get to the Numbers with Google Analytics! Each analytics platform has strengths and weaknesses. In a rapidly changing world where versions and implementations of API’s change quickly, Smart Merchandiser adapts to newer versions of API’s and authentication quickly. For example, Smart Merchandiser recently adopted the Google Analytics OAuth 2.0 to get access to read-only data from Google Analytics instead of requiring customer credentials. Leverage Adobe Analytics Strength in Custom Created Metrics! Adobe Analytics (Omniture) is widely used by business large and small. Smart Merchandiser has not only successfully onboarded clients depending on Omniture for analytics but has thrived in satisfying customers to fetch their own custom created metrics which other tools would not readily do so. Omniture has features which allow the data to be segmented in a number of ways and Smart Merchandiser displays the segmented data as expected by the clients. Get the Full Picture with IBM Digital Analytics! 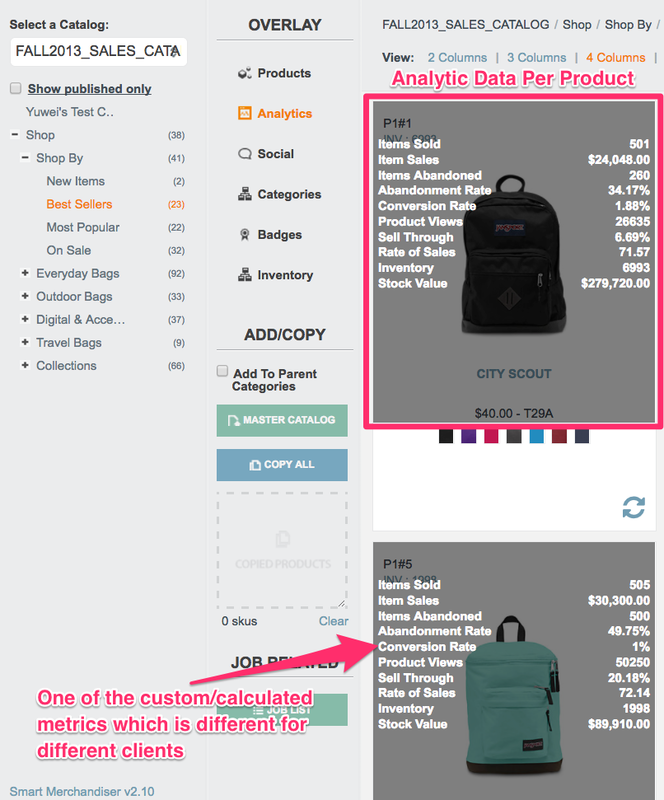 Smart Merchandiser also allows you to fetch your data using the CoreMetrics API. Even though CoreMetrics does not provide a real time analytics fetching API, Smart Merchandiser is able to use the latest and complete set of data from the CoreMetrics API. The data fetched is then displayed to the merchandiser. Smart Merchandiser makes sure to pull only the complete set of data instead of getting incomplete and inconsistent data. It is difficult to fetch analytics data from a tool which does not provide real time data but Smart Merchandiser does well in such a situation too. Put Analytics To Work for You! For any ecommerce business, large or small, making the investment is analytics is easy. The difficult part is to regularly fetch the data, monitor for variances and understand what is happening to the business, day in and day out. Smart Merchandiser makes the tedious and difficult job easy by aggregating real-time data and displaying it on each item. When using Smart Merchandiser, merchandisers are able to save on the average 80% of their time and help grow the business by 20%. Put your hard-earned investment in analytics to work for you!